After L.A. Riots, A Failed Effort For A Broken City Twenty years ago, while the ashes of the riots in L.A. were still smoldering, then-Mayor Tom Bradley announced a new organization that would repair the shattered city: Rebuild L.A. Its mission was to spend five years harnessing the power of the private sector to replace and improve on what was lost. While it created a lot of hope, it created even more disappointment. A fire burns out of control at the corner of 67th St. and West Blvd. in South Central Los Angeles on April 30, 1992. Hundreds of buildings burned when riots erupted after the verdicts in the Rodney King case were announced. 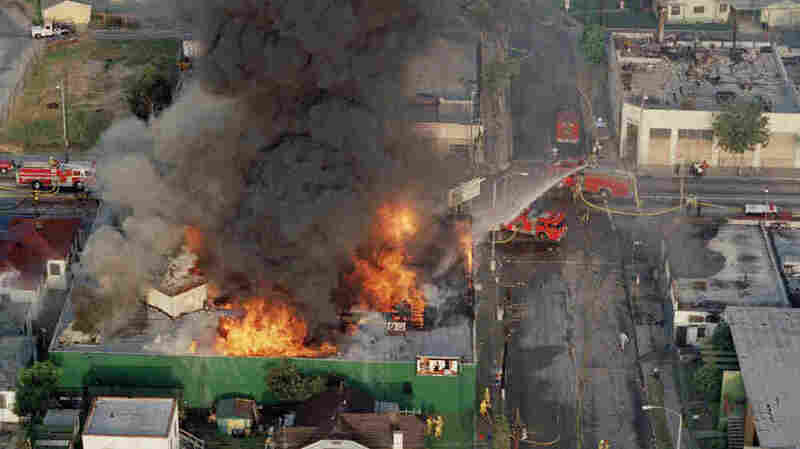 The Los Angeles riots began 20 years ago Sunday, when a jury acquitted four police officers in the beating of black motorist Rodney King in 1992. While the ashes were still smoldering, then-Mayor Tom Bradley announced a new organization that would repair the shattered city, Rebuild L.A. Its mission was to spend five years harnessing the power of the private sector to replace and improve on what was lost. While it created a lot of hope, it created even more disappointment. In the aftermath of the riots, more than 1,000 buildings were damaged or destroyed — $1 billion worth of property. The hopes pinned on Rebuild L.A. were enormous. Los Angeles County Supervisor Mark Ridley-Thomas says the organization had nothing much to do with the revitalization of many areas, like the intersection of Manchester and Western avenues in south L.A. It was mostly market forces with some help from the city. "The public sector had an obligation to help the market accomplish what it needed to, which was to help these businesses back on their feet," Ridley-Thomas says. Rebuild L.A. was the target of complaints almost from the beginning. Initially, discontent was aimed at the organization's chairman, Peter Ueberroth. Some of L.A.'s diverse communities thought that a white businessman from Orange County was an unlikely choice to head the rebuilding effort. So co-chairs were added, including a black man and a Latina. Then, there were demands to enlarge Rebuild L.A.'s mission to include health, education, housing and so on. The board of Rebuild L.A. ultimately expanded to 94 people. "If you complained about rebuild L.A., they just put you on the board," says political scientist Raphael Sonenshein, the director of the Pat Brown Institute at California State University Los Angeles. He says Rebuild L.A. was a by-product of the city's political collapse. "The mayor was on his last legs politically [and] his arch enemy, the police chief, was about to leave office under attack," Sonenshein says. "[It] almost seemed like the private sector was the one edifice left standing, but as it turned out, they didn't really know what to do either." In fact, some of the private sector support for Rebuild L.A. was exaggerated. The organization announced that 68 companies were backing the effort, but the Los Angeles Times found that a quarter of those companies had no such plans. Some had never even been contacted. There were success stories, however, says John Mack, who headed the Urban League of Los Angeles up until 2005. With support from Toyota, they created a job training program in car repair. "It was successful for 12 years, where we placed 3,000 or more previously unemployed or underemployed members of the community," Mack says. All that the applicants had to do to qualify was read at the 8th grade level, and that turned out to be a problem. Mack says the program didn't end because of Rebuild L.A.'s failures, but because the school system failed. "It became a real problem in finding enough people who could qualify for admission," he says. Rebuild L.A. didn't just lose the city's confidence; it lost the city's attention as well. Less than two years after the riots, the Northridge earthquake caused an estimated $20 billion in damage. Water mains burst, gas lines exploded, freeways collapsed and 20,000 people were left homeless. Faced with such physical upheaval, the effort to rebuild after L.A.'s social earthquake could not compete.